Kitchens Are Monkey Business: Diners, Drive Ins, and Dives. Diners, Drive Ins, and Dives. will be at the Outer Banks Brewing Station next week. And Rosie wants to go! He said he'd have to check with the producers. That would be so awesome! I have my fingers crossed for you. Just don't get close enough to the lard weasel that you come home covered with greasy residue! OMG! Next you'll be referring to Mr. Hawthorne as Cletus and be puttin' a pinball machine in the living room. tortietat - I'll be careful! Ticks - I want a Foozball table so bad. I'm just keeping my fingers crossed that you don't get drawn into the dark side. I heard he was going to Tortuga's Lie as well. Keep us informed!! Hi, Amy. I've heard Tortuga's as well. Also Brine and Bottle and Ortega'z. Who knows? I've called OB Brewing Station and left my name and number. I have no access to these restaurants. As such, I am totally uninformed. Rosie Makes A Figgin' Great Sauce. Rosie Makes A Crab Meat Boule Appetizer. Heh. My Fellow Bloggers Can't Get Away From Me. Monday Night. Another Lovely Storm. Rosie Makes Her Corn And Black Bean Tortilla Pie. Fee-Yeddi Sightings On The Beach. Rosie Bakes Artisan Loaf #2 - The Baguette. News From The Outer Banks Sentinel. Rosie Makes Filone. It's Bread. 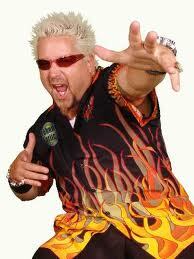 Fieri Update On The Outer Banks. Rosie Makes Stuffed French Toast. Mr. Hawthorne Makes Flounder. Two Ways. Rosie Makes Her World Famous Birthday Cake. What The Hawthornes Are Eating. Lunch. Rosie Makes A Black Bean And Corn Salad. What We Need Is Chowder And I Want More Cowbell. Colington Harbour Fourth Of July Boat Parade. The Hawthornes' Fourth of July Menu. Colington Harbour July 4th Boat Parade. The Hawthorne Boys Cook. They Can Actually Cook! Posh Nosh. Episode 4. Beautiful Food.